Furniture trends come and go, so it can surprise you that hairpin legs have been about for over seventy years. Their inventor, Vienna-born Henry P. Glass, he was working in New York for industrial designer Russel Wright when he invented the world’s first hairpin leg, in 1941. 1942 saw the start of this design as part of the Russel Wright ‘American-Way’ collection. From this came the desire for a new way of creating furniture. Using fewer materials (which was useful given post-war times) and a completely new style. Few originals were made but it is unknown if this was down to the lack of materials post-war or the desire to keep the collection limited. Molla Inc Company which is a New York famous enterprise which known for its production of high-quality patio furniture produced The American-Way “Hairpin Group. This is a great looking and functional product that used saving resources. To keep these pieces as good as when they were first manufactured chairs were covered with sailcloth covers. Legs were made from non-oxidising metal ensuring longevity outdoors especially in coastal patios. Prior to designing the Hairpin group, Glass had a remarkable life. After training as an architect in Austria, Glass worked for an interior company in Vienna as a furniture designer. He was sent by the Nazis to Buchenwald prison camp in 1938. His wife tried to get him out of the prison and then he immigrated to America in 1939. Admittedly Glass’s original designs, produced for an outdoor furniture collection which was called American Way, have been refined. Originally they looked so rudimental, a full steel frame with sail cloth seats and backs to withstand the elements. Through the 50’s, two designers Charles and Ray Eames took Glass’s concept and played with its ratio to make truly iconic and influential pieces. And, as with everything, the time has refined these designs and now the 21st-century version is truly grateful. In terms of function, the reason why it is so often excited by draftsmen and engineers as a stable seat upon which to do work of great accuracy was the beauty of the three leg stool is that it is self-leveling But, as with anything, the fee does reverberate quality. Furniture Hairpin’s Foot Glass is a great success in the press and finally begins a trend of different pieces of furniture combining his hairpin style. Surprisingly, the hairpin design was never patented and Glass was not recognized for this creation until many years later. Henry P. Glass has fifty-two patients in his name but unbelievably the hairpin leg isn’t one of them! He even failed to gain recognition for the invention of the ‘Hairpin Group’ until many years after its release. Glass designed a hairpin leg with two-leg and was used on chairs. Until 1954 that Richard Reineman designed a 3-rod hairpin leg to be used for tables. The design developed by is fairly different from the three-rod hairpin leg used today. The design of Reineman used a steel tube leg which was supported by a hairpin-shaped reinforcing brace – it was the first patent of the invention to contain consultation to a furniture leg with a “hairpin shape”. People are always creative to refresh life. At present, the DIY trend is very popular and also attracts DIY followers with ideas and metal hairpin legs. Just look on the internet about hairpin legs were able to create a myriad of products for his life. In Interior Design: The Hairpin legs is a V-shaped iron leg inspired by a classic hairpin, it can be easily attached to most surfaces to make tables, chairs or shelves. cabinets and other Décor products. Many people have changed their home space, workspace with their own handmade items, which is great because you can also recycle from old-fashioned items. and transform them into new things by their own creativity. For modern furniture designers and anyone with DIY ideas, hairpin legs are the perfect choice to create products when the budget is limited. You can make a tea table for your family without spending too much time and money. The hairpin legs are inspired by the classic hairpins, it will create the elegant for your modern home space when being combined with the wood top for dining tables, coffee tables or shelves. Because the idea is taken from the classic hairpins, At Nguyen Moc Decor these special hairpin legs will bring an elegant beauty to your space. Hairpin Leg is our standard leg model. It combines sobriety with elegance and fits perfectly in all types of interiors. In particular, with the elegant powder layers, these hairpin legs fit all spaces and can prevent rusts. Would you like to have a nice corner to showcase the cactus pots or some booklets? All you need is a decorative wall shelf made from a metal hairpin leg combined with a rectangular piece of wood. With just a few simple steps, you can create your own beautiful and impressive decorative shelf. Do you have a habit of drinking tea every night? Have you ever thought that you would make yourself a small tea table to satisfy your taste? Very simple! Just with a square stick and two pairs of metal hairpin legs, you can do it. If you are romantic and enjoy the sweet breakfast at the small table, the model table legs hairpin is a great suggestion. Take advantage of the hairpin legs to make yourself a mini dining table that can serve mobile breakfast, even in bed or sofa. What you need is around a wooden face, three 30cm metal hairpin legs. You can create additional accents for the table by wrapping a layer of yellow metal or decorating some of the motifs on the inside of the wood panel. Metal hairpin legs are designed to fit four L-shaped legs, with a bracket attached with four screw holes each leg. 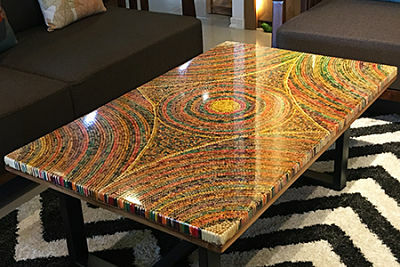 With just a few simple screws, you can also design your own unique items in your home. Metal hairpin legs are the perfect choice for a modern, elegant and ultra-modern living space. Unlike the cumbersome wooden table legs, the colorful metal hairpin legs will bring a charming beauty to your lovely house. Instead of buying expensive dining chairs or shelves, you can buy yourself some metal hairpin legs to make your own items. You also can make it yourself as gifts to your boss, your friends, and relatives.